The flu virus spreads through exposure to the respiratory secretions of a sick person. Unfortunately, a sick person need not be present for the infection to occur. According to the Centers for Disease Control and Prevention (CDC), the flu virus can survive on surfaces in your home or office for up to eight hours. Fortunately, there are several home remedies you can use to kill the flu virus before it causes another infection. 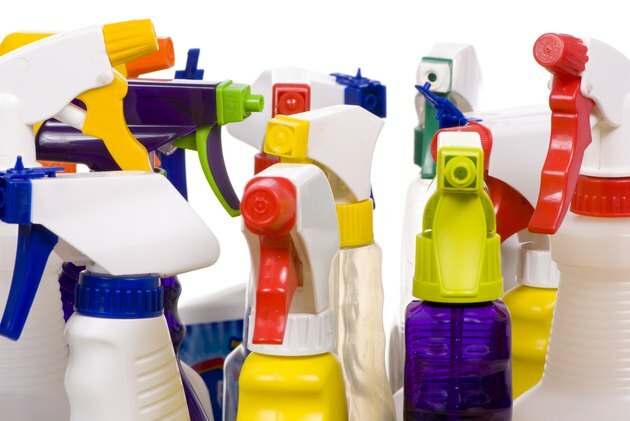 Thoroughly clean often-overlooked surfaces such as door knobs, faucet handles, counters and tables, sinks, telephone receivers and, especially, toys with soap and water, plus commercial sanitizers if desired. According to the CDC, soaps, hydrogen peroxides, alcohol, chlorine and commercial germicides all kill the flu virus. Purchase commercial sanitizer wipes or prepare a spray bottle with commercial or homemade sanitizer solutions to safely clean surfaces and objects that you do not have time or that are unsuited for washing with soap and rinsing in fresh water. Consult the "tips" section for a recipe for sanitizer solution you can make at home using chlorine bleach. Wash linens in a washing machine with standard laundry detergent and tumble dry on the hot setting. Do not "hug" laundry to your body as you place it in the machine because this can transfer the virus to your skin and clothing. Wash eating utensils and dishes in hot, soapy water or use an automatic dishwasher with the right kind of detergent for your machine. Quarantine items you can't clean for at least 24 hours after they have been used by a sick person. Encourage a sick person to wear a surgical or hospital mask outside of the bedroom or sick room to minimize contamination of cleaned areas and objects. Keep tissues and a trash receptacle with a plastic liner and a lid at the sick person's bedside and around the house. Household members should always cough or sneeze into a tissue, then discard the tissue. Encourage hand washing or the use of alcohol-based hand rub after coughing or sneezing; before handling clean linens or objects; and before or after handling the mouth, nose or eyes. Use a clean tissue to turn off faucet taps without recontaminating hands. Make your own sanitizer solution using household chlorine bleach. According to the University of Wisconsin, mix 1 tsp. standard bleach or 3/4 tsp. "ultra" bleach with 1 quart (4 cups) of water. Allow the solution to dry on the surface to be cleaned. Replace solutions weekly. Heat also kills the influenza virus, but the temperatures that are effective--167 to 212 degrees F--can also cause burns. With the exception of the dishwasher, leave heat-based methods for professionals. How Long Can the Flu Virus Live on a Surface?